The original seasoned wing, naked and baked in its all natural, un-sauced glory. Doused with a savory-mouthwatering barbecue sauce that captures the magic of the backyard grill masters. Sauced and tossed and then dusted with a mouthwatering blend of Parmesan and Romano cheeses. And you thought we only knew a thing or two about Mozzarella. The best plan to spice up any party. Don’t sweat the details, sweat the wings. Bold and savory, these wings bring the heat. 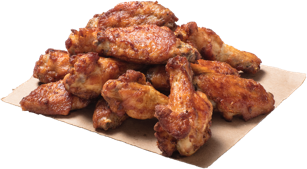 Wings sauce and tossed with a zesty blend of spices and a tangy, citrus kick. The right amount of spice to make you flap your wings.